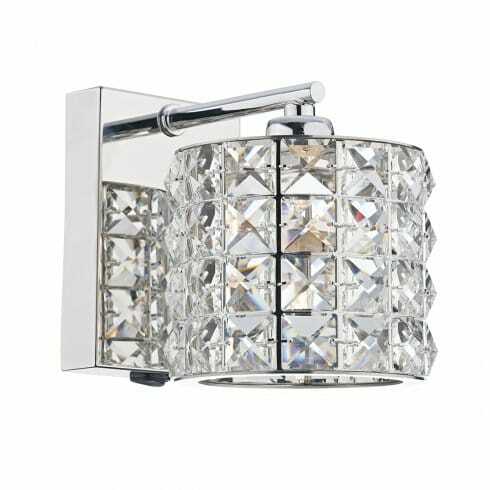 Dar Lighting Agneta single light switched halogen wall fitting features a square design wall plate with extending arm in polished chrome finish holding a cylindrical crystal glass shades. The product code for this Dar wall fitting is AGN0750. Sparkling halogen light is displayed though the crystal glass shades making this a perfect addition for modern or contemporary decors within your home. Double insulated and operated by a rocker switch located on the base of the back plate. The Agneta collection includes a matching 5 light bar ceiling pendant and 3 light flush ceiling fitting all of which can be ordered on our website.